General Guidelines for Estimating Wind Speeds 30-44 mph (26-39 kt) Whole trees in motion. Inconvenient walking into the wind. Light-weight loose objects (e.g., lawn furniture) tossed or toppled. 45-57 mph (39-49 kt) Large trees bend; twigs, small limbs break and a few larger dead or weak branches may break. Old/weak structures (e.g., sheds, barns) may sustain minor damage (roof, doors). Buildings partially under construction may be damaged. A few loose shingles removed from houses. 58-74 mph (50-64 kt) Large limbs break; shallow rooted trees pushed over. Semi-trucks overturned. More significant damage to old/weak structures. Shingles, awnings removed from houses; damage to chimneys and antennas. 75-89 mph (65-77 kt) Widespread damage to trees with large limbs down or trees broken/uprooted. Mobile homes may be pushed off foundation or overturned. Roof may be partially peeled off industrial/commercial/ warehouse buildings. Some minor roof damage to homes. Weak structures (e.g., farm buildings, airplane hangars) may be severely damaged. 90+ mph (78+ kt) Many large trees broken and uprooted. Mobile homes damaged. Roofs partially peeled off homes and buildings. Moving automobiles pushed off the road. Barns, sheds demolished. 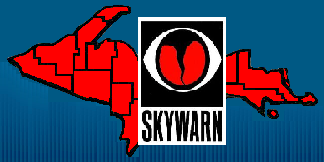 How Should I Report an Obervation?On your local Skywarn Amateur Radio Repeater, if you have one. Any other details that are important – How long did it last? Direction of travel? Was there damage? etc.